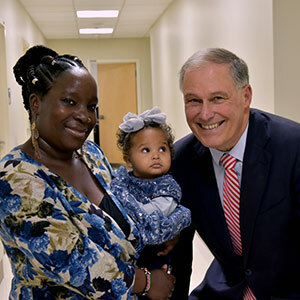 Washington State is taking action to end our opioid crisis. Every day, an average of two Washington residents die from an opioid-related overdose. These deaths are one of the tragic aspects of this complex public health problem. In addition to overdose deaths, there are thousands of non-fatal overdoses, tens of thousands of people struggling with opioid use disorder, and hundreds of thousands of people misusing prescription opioids. People with opioid use disorder are not nameless strangers. They are our mothers, fathers, sisters, brothers, children, relatives, colleagues and friends. Anyone can develop dependence on opioids. People who need treatment, or have a loved one that needs treatment, can call the Washington Recovery Help Line at 1-866-789-1511. Many communities have formed groups to develop local solutions to their specific needs and resources. Governor Jay Inslee’s executive order brings together state agencies, local organizations, law enforcement, tribal governments, and other public health partners to implement a State Opioid Response Plan. Expanding access to effective treatment and recovery support. Saving people’s lives by reversing overdoses. Shaping policy and program development using data & evidence.